Favorite characters and titles are now available in board book editions. Dinos delight in acting like toddlers in original board books starring the prehistoric heroes first introduced in How Do Dinosaurs Say Good Night? by Jane Yolen, illus. by Mark Teague. Just right for smallest hands, How DoDinosaurs Count to Ten? encourages youngsters to practice their numbers from a tyrannosaurus rex clutching his ""one tattered teddy bear"" to an apatosaurus reading 10 books (Teague subtly labels each terrible lizard somewhere in the drawing). 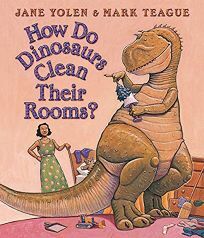 The scaly stars set a good example (sort of) in How Do Dinosaurs Clean Their Rooms? as a velociraptor slides pink pajamas behind the bathroom door, and an airborne tropeognathus drops its clothes into a hamper. .